I am always loathe to give a Bible a negative review. But study bibles are very expensive and I certainly want any reader to be able to make a fully informed choice. With that said, I am afraid I’m disappointed in the Faithlife Illustrated Study Bible. This study bible has numerous timelines which are an incredible tool for understanding the order of events when different books, like the prophecies, may overlap in time periods. However, most of the timelines in this book have no scriptural reference – It says “Adam and Eve live” but does not tell me where the Bible actually tells me that; “Tower of Babl” appears on the timeline but it doesn’t direct me to the part of the Bible where I can read about that tower. 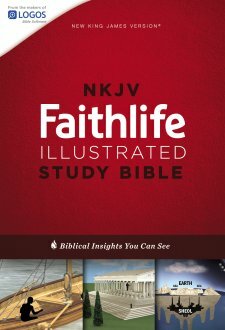 The very title of the Faithlife Illustrated Study Bible indicates it is illustrated. There are some very interesting archeological pictures and application of those items to scripture, such as The Babylonian Chronicles – clay tablets that narrate events in Babylons history including Biblical history. The table of contents lists 54 of these infographics they are distributed about 3 per book with Exodus and 2 Kings each having 6. However, many of these graphics are not photographs but drawings such as a layout of Rome in Paul’s day. There are also a number of family trees which help the reader relate various generations. I found these a little difficult to read, but families were very different in biblical days, with multiple wives and concubines bearing children. There probably is no easy way to graph these. On a very postitive note, I did find the commentary to be excellent. And the introductions to individual books of the bible was more helpful than in most study bibles. There concordance in the back seems larger than most, however, the font is very small. There are a total of 14 maps in the back; they are printed on the same paper as the text – as opposed to glossy photo paper – so the colors are pretty subdued but that certainly doesn’t affect the quality of the information they present. I can offer a recommendation of the commentary in this bible but can only give it 3 stars because I just really feel like you wouldn’t get what you expected based on the title and presentation. Thomas Nelson, the publisher of the NKJV Faithlife Illustrated Study Bible, supplied a copy of this book in exchange for a fair and impartial review.